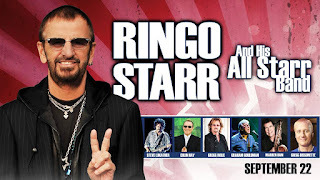 This time out, his all-star band includes Gregg Rolie of Santana and Journey; vocalist Colin Hay from Men At Work; successful songwriter and 10CC member Graham Gouldman; Steve Lukather from Toto, veteran studio/live tour musician Warren Ham; and drummer/professional instructor Gregg Bissonette. Count on hearing a few hits songs from each all-star. The two-day Goose Island 312 Block Party kicked off tonight with performances by TV On The Radio, Sunflower Bean, and four other bands. Drive By Truckers and The Hold Steady headline tomorrow night. The festival is being held just outside the brewery, at 1800 W. Fulton Street. Minstrel Palooza Live returns to Durty Nellie’s in Palatine tomorrow for another gathering of musicians related in various way to the Minstrels Music Store in Niles. Scheduled acts include Gus Adonis; Kevin Lee and The Kings, Cracked Actor; Van Go; Todd Money Experience; Larry Mitchell and Dave Ulrich; Charlie Victor; and Tiger Bite. Admission is free, and the show starts at 1:00 p.m. Van Go has a new album titled I Wish I Could Be Grateful coming out next Friday, September 28. 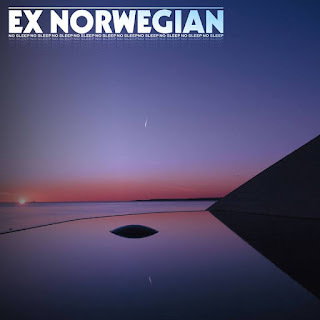 Power pop expert Boris Boden recently played a track from it on his Secret Weapon podcast on Woody Radio. MusicDirect is holding a “Rock ’N’ Roll The Warehouse” Vinyl LP Sale! tomorrow Saturday between 10 a.m. and 3 p.m. at 1811 W. Bryn Mawr in Chicago. The Facebook post promises lots of stuff—imports and domestic—in near mint shape. The records are mostly from the 1970s, with a few from the 1950's. Grand Rapids-based band The JetBeats will be performing tomorrow night at Montrose Saloon on Chicago’s north side. 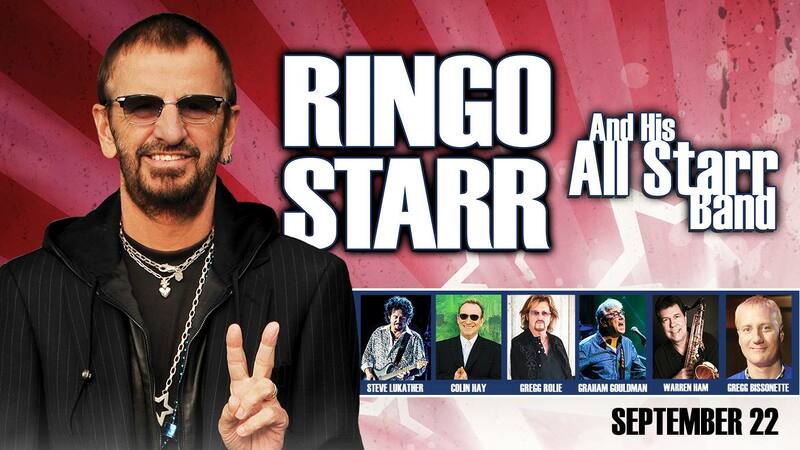 Judging from the catchy 1960s flavored tunes on their latest album, it’s going to be a fun show. Tickets went o sale today for Elvis Costello and The Imposter at The Vic on November 14; David Crosby at North Shore Center For The Performing Arts on November 19; Rhett Miller at SPACE on December 20; Liz Phair and Speedy Ortiz at Metro on October 13; Procol Harum at City Winery Chicago on February 20 and 21; Kasim Sulton’s Utopia ar City Winery Chicago on March 7; and Teenage Fanclub at Metro on March 6. Incoming: The Charlatans UK have a gig coming up at Bottom Lounge, which is just west of downtown, next Tuesday. Belly will be doing a show at The Vic Theatre on Saturday, October 6; Fleetwood Mac will be at the United Center on October 6; and Death Cab For Cutie has a show at the Auditorium on October 7. The Petty Kings will bring their tribute to Tom Petty to The Prairie Arts Center in Schaumburg tomorrow night as part of a double bill with the ‘70s FM Radio Rock band. 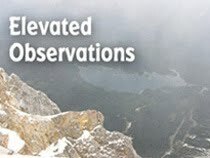 Tellin’ Tales Theatre will present Six Stories Up In Climate Change, the latest installment in its long-running Six Stories Up series, on the weekends of September 28 – 30 and October 5 – 7 at the Filament Theatre. The musical comedy, written and performed by middle school students and adult mentors with and without disabilities, is set in Alaska and delivers a timely message about saving the environment. Tickets are $20 for adults; $15 for children. Filament Theatre is located at 4041 N. Milwaukee Avenue in Chicago. The Old 97’s and Old St. Nick. Having seen The Old 97s bring down the house at Durty Nellie’s in Palatine, I have high expectations for their very first Christmas album Love The Holidays. The cover photo suggests these guys aren’t expecting much in the way of presents, but they’re gifting us with a mix of standards, originals like “Snow Angels” and “Gotta Love Being A Kid (Merry Christmas),” as well as their own take on “Auld Lang Syne.” Frontman Rhett Miller has a solo effort titled The Messenger coming out on November 9. More holiday merriment. The Monkees Christmas Party, also a mix of standards and originals, is available for preorder in CD and digital format. The new songs were penned by Peter Buck and Scott McCaughey; Rivers Cuomo; Andy Partridge; and Adam Schlesinger. Destinos, the 2nd Chicago International Latino Theater Festival, kicked off today and runs through October 21 at various venues around town. 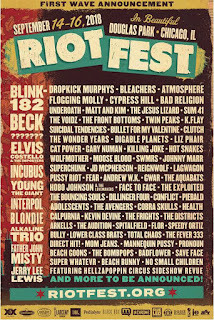 Welcome to all the musicians gathering in Douglas Park this weekend for Riot Fest. The extensive and eclectic lineup includes Elvis Costello and The Imposters; Johnny Marr; Liz Phair; Beck; Blondie; Cypress Hill; Twin Peaks; Cat Power; Superchunk; Killing Joke; Matt and Kim; Flogging Molly; Alkaline Trio; Gary Numan; The Exploited; Jerry Lee Lewis; and Digable Planets. By the way, Look Now, the new album by Elvis Costello and The Imposters, will become available on October 12. The recently reformed Off Broadway, led by Cliff Johnson, will be opening for Pablo Cruise of “A Place In The Sun” fame tomorrow night at The Arcada Theater in St. Charles. WXRT air personality Terri Hemmert will join Phil Angotti, EXPO ’76, Live To Sing Choir, and other guests at Fitzgerald’s this Sunday, to celebrate the life of Val’s Halla record store owner Val Camilletti. My nephew Joe Flamm, champion of this past season’s Top Chef on the Bravo Channel, will be one of the well-known chefs on hand for the Fulton Market Harvest Fest tomorrow and Sunday. Rick Bayless, and Stephanie Izard will also do some cooking there. The Fulton Market Harvest Fest also has a full slate of music acts scheduled, and several local restaurants will be represented. Did I mention I’m his godfather? Joe Flamm will also be among the 250 chefs at this year’s Chicago Gourmet Rock The Fork event at the Pritzker Pavilion in Millennium Park on September 29. There will a 93XRT live music stage as well. The Indie Press Fest takes place tomorrow from noon to 4:00 p.m. at publisher 826CHI’s storefront location at 1276 Milwaukee Avenue on Chicago’s north side. As noted in this week’s edition of Chicago free paper Red Eye, there will also be music and beverages. New albums released this week include The Crossing by Alejandro Escovedo; True Meanings by Paul Weller, and Snow Bound by The Chills. Tickets went on sale today for A Bowie Celebration with Mike Garrison, Earl Slick, Gerry Leonard, Carmine Rojas, Bernard Fowler, Corey Glover, Lee John, and other musicians at The Vic on February 22. City Winery Chicago has just announced that Procol Harum will be performing at the venue next February 20 and 21. Spertus Studios is hosting the Printer’s Row Art Fest tomorrow and Sunday in Chicago’s Printer’s Row area in the south Loop. Chicago-based rock critic Jessica Hopper will be promoting her new memoir book Night Moves at some upcoming events in the area. She’ll join Megan Stielstra for a joint book release at the Women and Children bookstore on September 20, has an appearance at the Empty Bottle club on October 29, and will join José Olivarez at the Chicago Humanities Festival on November 4. That special version of Sunshine Boys’ stellar debut album Blue Music in a limited-edition (250) blue vinyl package is now available via Cheap Kiss Records. Minstrel Palooza Live returns to Durty Nellie’s in Palatine on September 22 for another gathering of musicians related in various ways to the Minstrels Music Store in Niles. Scheduled acts include Gus Adonis; Kevin Lee and The Kings, Cracked Actor; Van Go; Todd Money Experience; Larry Mitchell and Dave Ulrich; Charlie Victor; and Tiger Bite. Admission is free, and the show starts at 1:00 p.m. The Petty Kings will bring their tribute to Tom Petty to The Prairie Arts Center in Schaumburg next Saturday, September 22 as part of a double bill with the ‘70s FM Radio Rock band. AntiFlag’s video of its cover of Buffalo Springfield's “For What It’s Worth” is being released in a partnership with Everytown, a movement to end gun violence. The veteran punk band will release its latest album American Reckoning on September 28. Destinos, the 2nd Chicago International Latino Theater Festival, kicks off September 21 and runs through October 21 at various venues around town. Released earlier this year, the seven-song EP By The Light Of The Moon is an impressive second effort from Moon Darling. It follows Dreams, which introduced the Seattle-based band’s hypnotic and self-described “psych rock” in 2016. Lead vocalist-lead guitarist Michael Julian Escobar once again spearheads an adventure that touches on several genres without locking in on any of them. Escobar and bandmates drummer Michelle Nuño, keyboards player Mathew Buckner, and bassist Jack Jay have a knack for immediately grabbing the listener’s attention with playful intros. “Soul Mine” kicks off with some familiar scary music before shifting to an energetic arrangement, and “Don’t Rise” opens with exotic middle-eastern instrumentation. “Right All The Time” drifts in on Buckner’s atmospheric keyboards but then morphs into an earthy blues number. 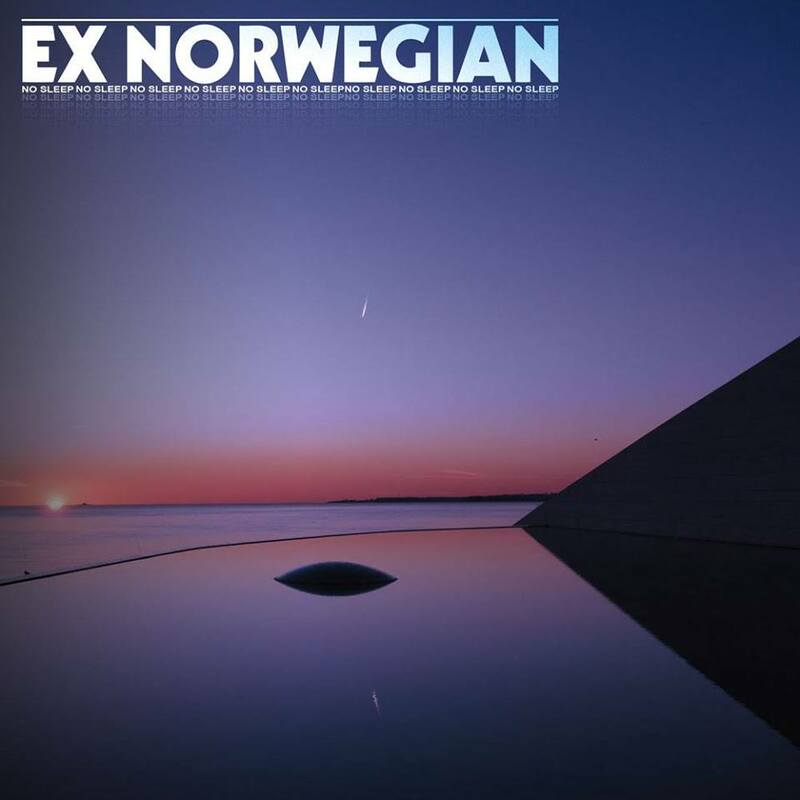 Escobar’s distinct vocals capture the emotional sentiment of the title track, which also features an irresistible groove. And on songs like “When The Morning Comes” and “Learned Amongst The Sky,” his fluid guitar playing evokes Robin Trower on Bridge Of Sighs. 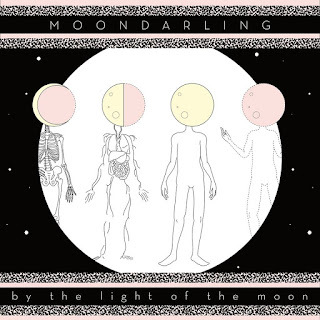 “She Said (The Key)” finds Moon Darling taking a lighter approach, but still allows Nuño to showcase her powerful drumming. I wasn’t able to do a Slumgullion on Friday because my wife Pam and I were out making merry with some friends at the classy and fun River North Design District Walk. So here’s a Sunday look at what’g going on in the entertainment world. Welcome to all the musicians who have traveled here for our annual World Music Festival Chicago, and to all the fans who’ve come to watch them perform. The festival opened this past Friday and will run through September 23 at various locations around the city. And so this is what you put on your Christmas cards when you mail them this year. The U.S. commemorative stamp for John Lennon was unveiled on Friday at a ceremony in New York attended by Yoko Ono. The stamp uses the cover of Lennon’s Walls and Bridges LP. Tickets are now on sale for Peter Asher and Jeremy Clyde at City Winery Chicago on November 6; Vanessa Davis Band at FitzGerald’s on November 16; Little Steven and The Disciples Of Soul at Copernicus Center on November 5; Nick Lowe at SPACE on December 29 and 30, and Nick Lowe’s New Year’s Eve bash with Los Straitjackets at SPACE. Michael Nesmith and The First National Band have a gig coming up next Thursday, September 13 at the Old Town School of Folk Music. Congratulations to Imogene Bebb, who does a fine job managing the former Hollies lead vocalist Allan Clarke Appreciation Society Facebook page, on embarking on a music career of her own. A video of her performing a demo version of her original song “(H)ours” with bassist Jim Preece can be seen on YouTube. That special version of Sunshine Boys’ stellar debut Blue Music in a limited-edition (250) blue vinyl package is now available via Cheap Kiss Records. Scott Ligon will host an All-Star Freakout next Wednesday, September 12, at FitzGerald’s. Four days later, on Sunday, September 16, WXRT air personality Terri Hemmert, Phil Angotti, EXPO ’76, Live To Sing Choir, and other guests will gather at Fitzgerald’s to celebrate the life of Val’s Halla record store owner Val Camilletti. Paul McCartney’s latest album, Egypt Station is now available, and some critics are calling it his best effort in years. I haven't had a chance to listen to it yet, but “Come On To Me” was certainly a promising start. Riot Fest returns to Douglas Park next Friday, September 14, and will run throughout the weekend. 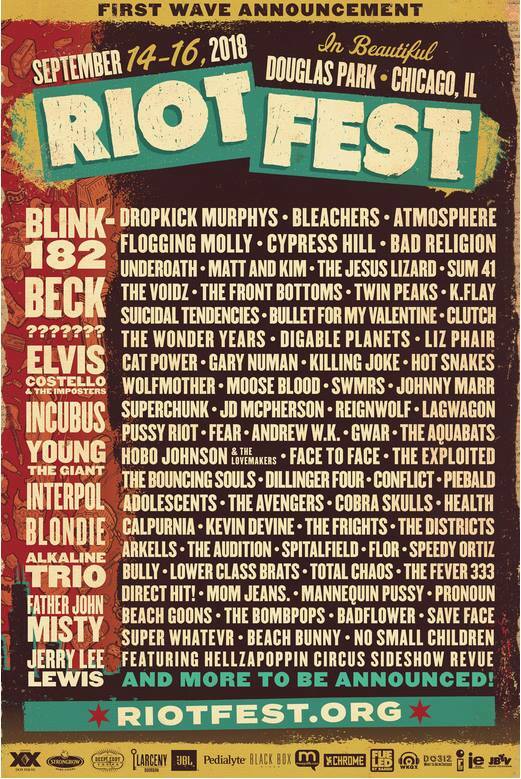 Chicago Innerview, a local publication that specializes in covering the city’s mega music festivals, has released a Know Before The Show guide to Riot Fest. A dapper looking Elvis Costello is on the cover, and there are 30 pages profiles on Beck; Blondie; Cypress Hill; Twin Peaks; Liz Phair; Cat Power; The Exploited and other participating acts. You can pick up a free copy at Reckless Records stores. We’re just about a month away from Jodie Whittaker’s debut as the title character in the long-running British sci-fi series Doctor Who. She’ll be the first actress to take on the traditionally male role of a time lord capable of creating an entirely new appearance and personality via regeneration. Whittaker previously starred in the British series Broadchurch with David Tennant following his stint as The Doctor, so it seems likely the two of them occasionally discussed his time on Doctor Who. At any rate, best wishes to Whittaker on her new adventures through time and space. I finally watched Twice Upon A Time, Peter Capaldi’s farewell episode of Doctor Who via a DVD from the Palatine library, and now intend to buy my own copy. It initially took a while for me to warm up to his version of The Doctor (particularly following Tennant and Matt Smith) but he fully embodied the character by the end of his tenure. On Twice Upon A Time, he’s funny, compassionate, clever, and very wise. Actress Pearl Mackie does a stellar job of helping with Capaldi’s sendoff, and it was nice to see the show give her character an imaginative and heartfelt exit. Pearl Mackie will be one of the guests at Chicago TARDIS when it comes to the Westin Lombard Yorktown Center on the weekend of November 23 – 25. In other convention news, ACE Comic Con Midwest comes to Navy Pier in Chicago on the weekend of October 12 – 14. Scheduled guests include Chris Evans, Josh Brolin, Elizabeth Olsen, Lee Pace and Zazie Beetz. There will also be over 60 comic writers, artists, and creators, as well as several vendors. It’s not surprising that Juliet, Naked combines rock and roll, clever dialogue, and romantic tension in a way that’s reminiscent of High Fidelity. Both films were based on novels written by Nick Hornby. Another point of interest is that director Jesse Peretz commissioned Robyn Hitchcock, Conor Oberst, M. Ward, and Ryan Adams to compose the songs the film’s fictional American alt rocker Tucker Crowe (Ethan Hawke) is said to have recorded in the 1990s. Juliet, Naked also pokes fun at self-important music bloggers who fawn over their heroes and occasionally get things wrong. At the risk of sounding like Duncan, the British blogger played by the always funny Chris O’Dowd, here are a few observations on Crowe’s music. It was a bit disappointing that his songs, which we’re told marked him as a rising star before he mysteriously disappeared, aren’t featured that much in the film. With the exception of Oberst’s energetic “LAX,” the Hawke-sung originals don’t drive the action as well as gems by The Three O’Clock (“Sorry”) and Squeeze (“Goodbye Girl”). The Three O’Clock and Squeeze aren’t included on the soundtrack album, but Hawke’s heartfelt take on The Kinks’ “Waterloo Sunset” is. Fortunately, the plot is a fun series of twists and turns that finds Duncan’s girlfriend Annie (Rose Byrne) somehow striking up an online friendship with Crowe after he sees her negative comments about him on Duncan’s blog. Both feel they’ve wasted years of their lives—Crowe on drugs and alcohol and Annie on playing second fiddle to Duncan’s fanboy obsession with Crowe. Eventually, Crowe travels to the UK, and finds Annie even more appealing after meeting her in person. Meanwhile, Duncan has been having an affair with a co-worker, and is flabbergasted to discover Annie romantically involved with the musician he’s idolized for decades. Congrats all around to Hornby, Peretz, Hawke, O’Dowd, and Byrne for making this tale of getting one’s life back on track so funny and enjoyable. A few months back, the legendary local power pop band Frisbie celebrated its 20th Anniversary with special guests at the Martyrs’ club on Lincoln Avenue. They have a new gig coming up with Eric Chial from The Bon Mots and Decoy Prayer Meeting at Montrose Saloon on October 21. Montrose Saloon, located at 2933 W. Montrose, has been building a loyal following due to musician and self-described “talent buyer/sound wrangler” Chial lining up some of Chicago’s best music acts. 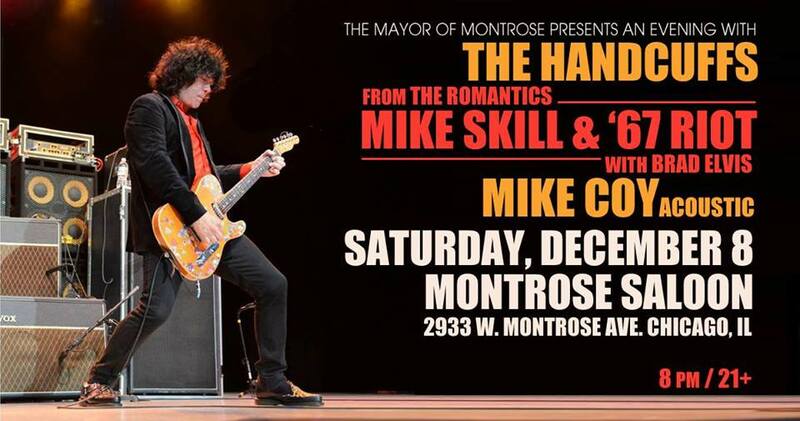 The Handcuffs will be at Montrose Saloon on December 8, along with a special performance by singer-guitarist Mike Skill from The Romantics with his new side project ’67 Riot. 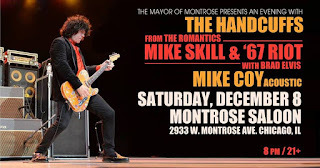 Brad Elvis, who plays drums with The Handcuffs and The Romantics, will be part of the Mike Skill and ’67 Riot performance. The evening kicks off at 9:00 p.m. with an acoustic set by Mike Coy. The September issue of the Illinois Entertainer has a profile of WXRT DJ Lin Brehmer in which he explains that he’s able to enjoy late-night concerts and still do his early-morning shift thanks to his afternoon naps. Having talked to Brehmer on a few occasions, I can attest to IE media columnist Rick Kaempfer’s assessment that the DJ always treat fans as if he was their “best friend in the whole world.” The profile also offers some fascinating insight on how Brehmer creates his weekly Lin’s Bin commentary, and I’m still hoping he’ll put out a collection of those enjoyable segments, either in book or audio form. That same issue of the Illinois Entertainer mentions a recently restored version of John Lennon and Yoko Ono’s 1972 film Imagine that’s due to hit theaters in the near future. I.E. reports that Imagine has an audio remix by Grammy Award winning engineer Paul Hicks. By the way, Hicks is the son of original and still-with-the-band Hollies guitarist/harmony vocalist Tony Hicks.